36 inches; has Express Pass access. Woody Woodpecker’s Nuthouse coaster is a family-friendly ride through the trees and a nut factory with your pal Woody. It is very similar to Flight of the Hippogriff over at the Wizarding World of Harry Potter. Woody Woodpecker’s Nuthouse Coaster at Universal Studios Florida. 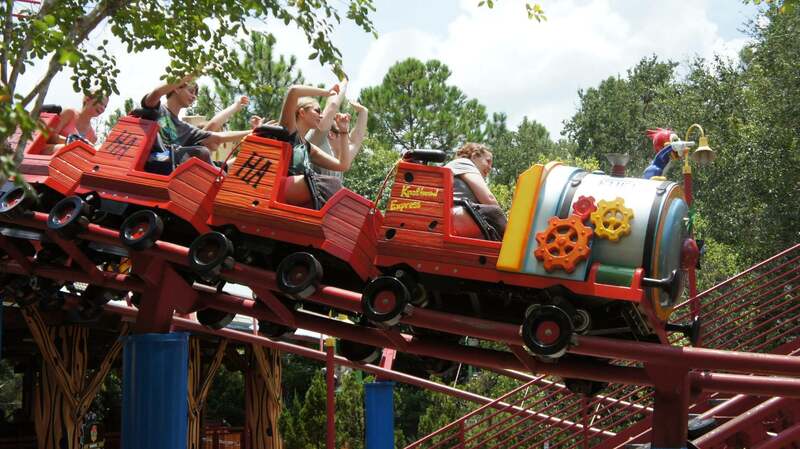 Woody Woodpecker’s Nuthouse Coaster was the first roller coaster built on Universal property. When crowd levels are slow to moderate, the attractions inside Woody Woodpecker’s KidZone, including Nuthouse Coaster, typically do not open until 10:00am. When crowd levels are busy to very busy, the attractions typically open when the park opens at 9:00am. Visit our Universal Orlando crowd calendar (the link will open in a new window) to determine the crowd levels for your travel dates. I love this little ride. This is a "kids" roller coaster that adults will love. My only complaint is that it's short. If you don't have an express pass, you can ride this with your eyes closed and pretend you're on Flight of the Hippogriff. The theming is classic Woody Woodpecker so kids and adults will love it. While the roller coaster fanatics might turn up their noses at this, we think it's great. For coaster haters (like myself), this kiddie coaster is PERFECT! Meant ideally for kids, this attraction is great for those faint of heart as well. The lines are also usually pretty short too (thanks, restless kids and their families!). The theming wasn't memorable enough so maybe that could use some work. The little ones liked this coaster. It's not fast and don't have any drops so it was perfect for them. I'm glad it didn't last too long because it was a little bumpy for me. I love the fact that they still allow adults to go on this without children! However, as a 6 year old this was one of the first rollercoasters I went on. I loved it and still do now. Woody Woodpecker is an iconic childhood icon, mostly to kids from 70's, 80's and 90's eras, but I hope the kids of today still love it just as much. Love that when you get to the top of the hill he makes his signature laughing noise! As a child growing up in the 80's, this ride brings me way back to that time period. I love the trademark laugh of Woody Woodpecker. The coaster is almost always between and 5 to 20 minute wait so it is just one of those rides you can always get on without waiting for long periods of time. There are so many little props on the ride that make you giggle. Woody is, after all, the mascot for Universal Studios.